What did you think of this Brickfilm? We recreated about eight seconds from the Disney movie The Love Bug for the 2006 Brickfest. This is the scene where the Volkswagen (Herbie) jumps across a lake. This has been submitted to be shown before the awards ceremony for the animation contest in a montage of famous scenes from different movies. The Herbie model we used was designed by ME-Models. It can be purchased at their website. We'd like to thank ME-Models for letting us use their awesome car! Please leave a review in addition to voting. you should do more. that would be cool. 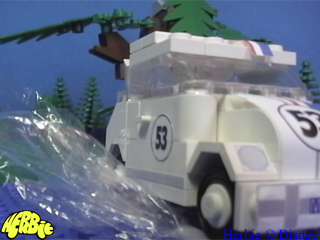 Our Herbie clip was one of the few selected to actually be shown at the 2006 Brickfest! Click Here to download and watch the completed montage (Requires Real Player). I think we will, after we've finished some of the other projects we're working on. We were pretty excited to see it in the final montage! Apparently over 400 people saw it, including some Master Builders and the CEO of LEGO! This clip is now available to watch on Google Video! A link to this clip was posted on a Dutch Volkswagen forum, VolksForum.com. Original: "De bekende scene uit herbie the love bug, maar dan wel in LEGO"
So- I think it's saying "This is a well known scene from Herbie the Love Bug, done well in LEGO"
I think this one says "I found this video clip of Herbie the Love Bug made with LEGO. I'm disappointed that it is so short, but extremely well done"
Free Translation: Haha nicely done! Yay, this one makes sense!